This workbook provides every dictation assignment, comprehension question, and reading passage that you’ll need for a full year of writing instruction. 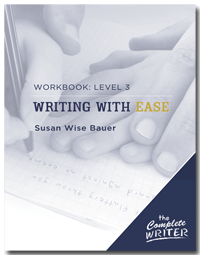 Using passages and sentences from classic children’s literature, Writing With Ease Level 3 Workbook allows young writers to practice their skills while absorbing the style and grace of great authors. Not sure that this is the right level? Check out our diagnostic evaluation. And if you want an overview of why you’re doing dictation and narration, be sure to listen to our most popular audio lecture, Susan’s Plan for Elementary Writing. Next year I will have a 6th grader and 4th grader. I have read the essays explaining about Writing With Ease and the intermediate level course The Complete Writer. I’m not sure where to start them. They are moderately proficient at narration, the older enjoys writing the younger does not. What would you suggest as a starting point for them?